Pumpkin is one of those foods that for some reason overloads American palates in the fall. Out of season no one has a second thought about this gourd. Yet, the weirdest part of this phenomenon is not just the must have drinks, but that the ‘pumpkin spice’ is what people crave. They aren’t even really after the pumpkin entirely. Heck they just assume that all pumpkin is the same. Well, it is really similar, but you probably didn’t know that canned pumpkin isn’t actually your average jack-o-lantern. Canned pumpkin is actually made from blue hubbard squash. You would think “ok but it is still a squash”, yet try to open up one of those blue beauties. You will need a nearly industrial strength saw to get inside. Thankfully, I’ve got a neighbor that dreams of being a lumberjack or I’d have been stuck with a 30 pound doorstop. The quest for the best orange flesh for your pie can be a harsh one. I still find it odd that everyone has to have that pumpkin spice. We’re not the biggest fans of the flesh but more so the seeds. 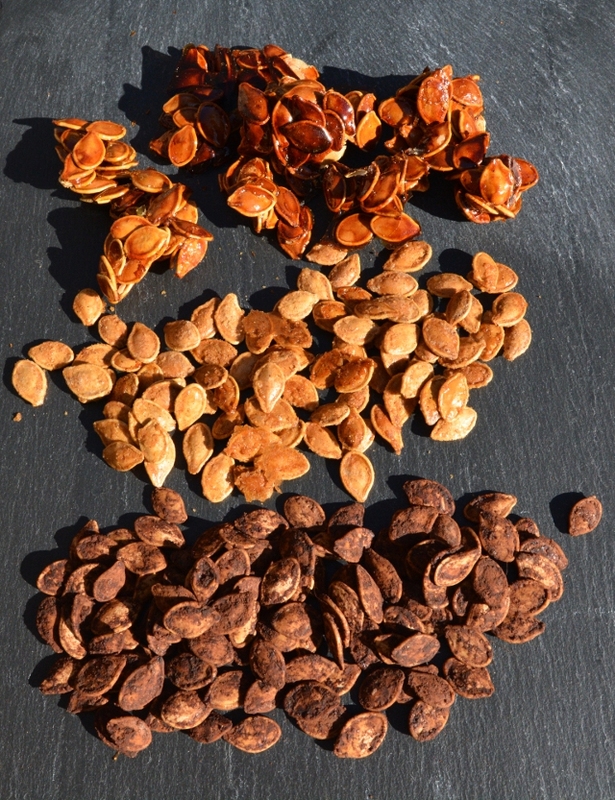 Pumpkin seeds can be a great snack and flavored to taste like anything. From sweet to savory to straight up roasted, they are diverse little bites of protein. We had a bounty of them at around 7 cups and made 3 different flavor choices. Cocoa and spice, both turned out as expected while spicy caramel turned out to be stickier than anticipated and is essentially pumpkin nut brittle. Literally, these pumpkin seeds will stick to anything and could potentially be considered a hazard, but the burn is soo good. So, Alison had me at “there’s a pumpkin sale at Jerry’s Fruit and Garden“. This is an entire experience in itself which is why I am not just skipping over it. On busy days you’ll be lucky to get into the parking lot and then the waiting to park your car will take ages. Yet, when you get inside you will find all the produce you could imagine. The hard to find items that you wouldn’t see except at ethnic stores will be present and in great condition. Just don’t be surprised at the traffic jams. You might get more action trying to get through an aisle than anywhere else. Older women are sometimes the worst culprits not in a mean-spirited way, but if you don’t let them at those persimmons you might not make it out the same way you came inside. Perhaps that sounds cruel but truly it is all about selection and survival. The selection and the prices do make Jerry’s a place worth your while. Not only do they have all produce in season, they tend to have extremely reasonable prices. So that is how we ended up with our seed bounty. How do you pumpkin in the fall?